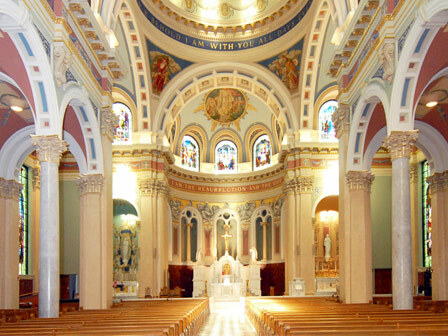 The Cathedral of St. Patrick in downtown Harrisburg is a motherchurch of the Diocese of Harrisburg, and is the seat of its bishop. The cathedral was built in the early 1900s in a Baroque Revival style with Renaissance Revival influences and capped with a classically influenced dome. The exterior of the building is covered in granite from North Carolina, and its interior features stained glass windows and marble. The cathedral has undergone several major renovations throughout its history. Today, the interior of the church features frescoed murals beneath its dome, a free-standing altar, a Stations of the Cross, and shrines in memory of the Blessed Virgin Mary and previous bishops.